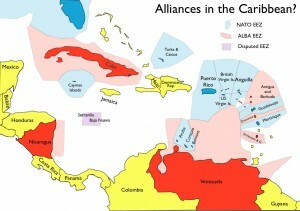 As explained recently in Geocurrents, the anti-U.S. ALBA alliance led by Venezuela is not what it might appear to be at first glance, as several small Caribbean countries have joined it more for economic than geopolitical reasons. Still, it seems worthwhile to map the potential geopolitical division of the Caribbean entailed by the existence of the ALBA alliance and that of its nemesis, NATO, led by the United States. The resulting map, posted above, shows both the land areas and the maritime exclusive economic zones held by members of the two blocks. The areas mapped within the NATO zone include both integral portions of NATO member states (southern Florida, the French overseas departments of Martinique and Guadeloupe, and the new special Dutch municipalities), as well as their Caribbean dependencies. The maritime dispute between the U.S. and Nicaragua is also indicated. Note also that Guantanamo Bay, perpetually leased by the United States from Cuba, is also indicated, and is exaggerated in size to be made visible.